Google launched its social networking site Google Plus. Along with Google plus came the 'g +1' button. Since then this button is being used to recommend content on Google by Google users. But now it has one more feature. 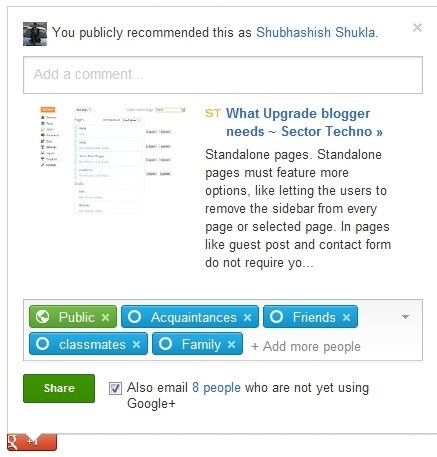 Today I found that on hovering your mouse on 'g +1' button a small section shows up showing what is recommended on your site. This feature may still require a user to be logged in to publicly recommend but recommended feature will show even if you are not logged in. You already have +1'd the post. In such case the window will show a sharing section. You might be knowing how to use this sharing section. A thumbnail, a title and small content is automatically fetched from the article. 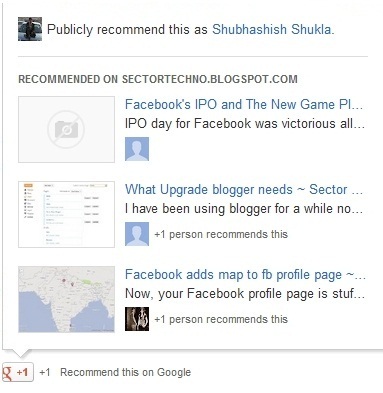 Now you can share the article on your Google Plus page. You can choose to make this share, a public share or select which circle member can see this on your Google Plus page. How Do I Pick The Best Hosting for my Blog? How to get discovered on internet?